We specialize in retirement planning and one of the most important benefits that you may have are your Social Security and/or other pensions. However, if you or your spouse are participants in certain “non-covered” pensions then your Social Security benefits may be reduced. It is important to understand these rules, how the apply to you, and how you may minimize their impact on your retirement plan. 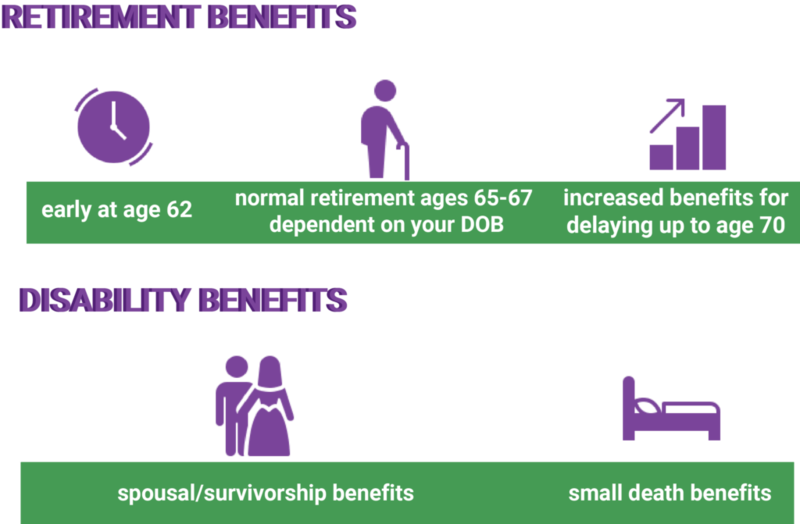 Below you will find introductory information that you should consider if you are looking to understand your Social Security benefits better, planning for an upcoming retirement and/or looking to hire a financial planner to help you with your retirement planning. Social Security was created in 1935 to provide a safety net of protection against the financial risks of old age, poverty, and parent-less children. It was subsequently strengthened gradually from 1952-72 to become the robust system we know today that many Americans have come to rely on as a major source of retirement income. Social Security was designed, and still very much remains, a progressive system that provides more robust benefits to lower income workers in proportion to actual contributions to the system. The WEP is designed to maintain SS’s progressive nature by reducing benefits to those that are receiving pensions (in which they did not contribute to Social Security – also called “non-covered” pensions) because they would receive higher payouts than their income should otherwise merit had they participated in Social Security for their entire working career. Many find this rule “unfair” however, we must realize that we do not generally pay enough into the system for the benefits promised and the system is designed to be a safety net to protect those on the lower end of the income scale. Thus the WEP tries to maintain this status quo for systems that exercise their right to be excluded from the Social Security system (generally, state pensions). So whether you agree with the WEP or not, if you are a participant in a “non-covered” pension, you should plan to reduce its effects and/or prepare adequately for a reduced SS payout. Will You be Affected by The WEP? How Much Can The WEP Reduce my Social Security? Schedule an appointment to speak with a Social Security counselor and they will be able to provide you with an estimate (generally, they only like to run estimates for you once you are close to retirement age because they don’t like to guess future earnings). You can hire a financial advisor/planner that has invested in software that can make these calculations for you and potentially run various permutations to help you maximize your benefits. The Government Pension Offset (GPO) was also established in 1983 to reduce spousal benefits due when a spouse received their own pension from a “non-covered” pension (generally, CSRS or a state pension). Social Security was initially setup to support traditional family values by helping to support non-working spouses and widows. Given that more and more spouses that used to be home-makers are working and building their own retirement benefits, Congress felt it necessary to limit the SS benefits due to spouses and widows to those that actually needed the traditional non-working spouse safety net. Who is Affected by the GPO? If you are receiving income from a “non-covered” pension (basically a pension in which you did not have to contribute to SS) and you are due a spousal or survivorship/widower benefit then you are most likely going to have a reduction of your SS benefit. How Much Can my Social Security be Reduced? You spousal/survivor benefit will be reduced by 2/3 of your “non-covered” pension benefit. Few people realize that there are many different strategies to claiming your Social Security benefits. Guess how many strategies most retirees consider and the impact that will have on their over-all retirement. Most retirees are leaving considerable amounts of money on the table and many “non-covered” pension participants are not even sure how their service will effect their SS, not to mention how they might maximize it. Additionally, individuals turning 66 in 2019 (full retirement age) are the last group that can take advantage of the restricted application filing method.